Bill W. and Dr. Bob, a play about the very earliest days of Alcoholics Anonymous, ran for 148 performances at New World Stages Off-Broadway and is now available on DVD (Hazelden, $29.95). This production is not perfect history, nor perfect drama, but good enough of each to make for a very compelling, very human encounter with what author Janet Surrey calls the “sacred story” of AA. 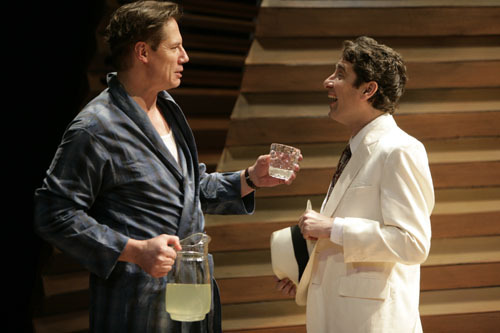 The play, which runs about two hours on the DVD, spends its first act telling the drinking stories of both Bill and Bob. We meet Bill during his cross-country motorcycle trip with his wife, Lois, to research companies for Wall Street. Bill is already making and breaking promises to quit drinking, but he is still far from the end of his descent. We meet Bob as a closet drinker and committed agnostic whose wife, Anne, has already become an active member of the Oxford Group. Cutting back and forth between their stories, the play does sometimes feel a bit uneven—lacking the focus of a unified arc and skipping rapidly over chunks of history—but it quickly progresses to the day when AA’s co-founders first met; here the play slows down, finds its focus, and starts to shine. Bill’s first meeting with Bob is rendered with insight, compassion, and, surprisingly, quite a bit of suspense. Even though we may be aware of the history and how things will progress, the play still manages to create some doubt as to whether these two drunks are really going to hit it off. Bob’s insistence that he only has fifteen minutes to spare, and Bill’s constant watch-checking are almost enough to make even the most well-versed viewer wonder if, in this play at least, Bill might walk out and AA might never be born. It is a tribute to the skills of everyone involved that the play is capable of this kind of effect—to engage us in the history that could have been as much as the history that was. In fact, the lead roles are executed with both skill and humanity, revealing the historical figures as human beings, locked in a struggle with alcoholism, not knowing if or how they’ll manage to stay sober another day. In their portraits of AA’s co-founders, authors Steven Bergman and Janet Surrey have not pulled any punches. The characters are on display in all their glory and failings. We see Bill passionately engaged in the work of helping other alcoholics, but we also see his drunken womanizing and his raging ego—both drunk and sober. Bob is funny, endearing, forthright, and incredibly stubborn, able to make us laugh wether he’s sloppy or straight. Several of Bob’s scenes portray him as fragile, alienated, the way most newcomers feel on day one; Bob’s first “Share” at an Oxford Group meeting is particularly effective in this way. And though the title characters get a good portion of the stage-time, their wives are not at all short-changed. Lois and Anne share the spotlight here just as they shared important roles in the formation of AA. One scene that stands out as remarkable is the one in Anne’s kitchen, when she and Lois are getting to know one another and they are joined by the wife of Bill D. (otherwise known as AA #3). This moment is rich with humor, tragedy, and honesty—the way a meeting is supposed to be. Refined over a year of practice and research, the DVD performance is solid throughout, although, as with most stage-to-home-video releases, there is an initial impression that the roles have been terribly over-played. The theater requires a certain amount of projection and emphasis that, on camera (and especially in a close-up), can be off-putting. Bill sometimes acts and sounds like he’s reading a page of 1920’s radio ad copy, and Bob can seem as if the actor listened solely to speaker tapes and is saying everything as if he were addressing a large meeting hall. However, after a few scenes, most viewers should be able to sink into the world of the stage and be captivated by it, larger-than-life stage performances notwithstanding. The theater also requires a degree of emotional openness and vulnerability, which is demonstrated here rather effectively by the players and even carries its strength without feeling exaggerated on DVD. Ultimately, this reviewer can find no fault in the production that should cause any interested party to avoid it. In fact, the play is good. Really good. And it brings AA history to life in a way that no previous effort has done. Rehabs around the world force their clients to sit through the Hallmark version of this story; they really ought to add this release to their library and give those guests a more intimate look at the founding days of AA. At the same time, it is hard to fully recommend the play without at least one serious reservation, and this has to do with the authors’ treatment of the religious elements that are central to this story. While Bergman and Surrey have done an excellent job establishing Bill and Bob’s involvement in the Oxford Group, they also carefully diminish the importance of that involvement, lending the play a subtle—but still noticeable—criticism of early AA spirituality. The Oxford Group characters in this play are really characterizations of religious stereotypes. Ebby Thatcher—a man who Bill insisted “did no preaching” when describing his recovery—comes off as a regular Billy Sunday, taking every opportunity to preach and insisting on involving Bill in his religion. T. Henry, a man in whose home the Akron group met regularly during the many years prior to their split with the Oxford Group, is played for comic relief. His description of his struggle with sin is made to look ridiculously petty, and his application of the term “maximum” to himself sets him up as a self-important oaf. Henrietta Seiberling, the woman who introduced Bill to Bob, comes off as cold and detached, practically inhuman; she’s drawn as someone who believes herself to be above worldly concerns. Bill’s own involvement with the Oxford Group is characterized as a time of misguided zealotry on Bill’s part, and running along the arc of his relationship with Bob is a gradual development away from Oxford Group spirituality and toward a people-powered solution to alcoholism. When Bob tells Bill he’s “sworn off God,” Bill responds that they should “leave God out of it for now,” which is true enough to the spirit of modern AA sponsorship, but here God never really makes it back into the equation. Bob’s character is particularly relieved to leave God out of his sobriety. In fact, it is a real moment of revelation for him when he decides that the solution for alcoholics is “not religion after all. It may just be,” Bob says, “other drunks and maybe, you know, something else working through us.” While this is not such a bad description of how many contemporary AAs view the spirituality of their program, it does sound a little strange coming from Bob, who is often thought of as the spiritual pillar of early AA and who remained a strong member of the Oxford Group long after the New York group made their split. It is a point of some concern that, despite the importance of Oxford Group practices to the formation of the 12 steps, the authors chose to marginalize all of their characters who were also members of the Group. And it is still more troubling that, even though Bob’s own recovery and his influence on early AA were rooted in his religious experiences, the authors still chose to shape his character as essentially irreligious. The result is a play which is willing to depart from history to convince us that the solution to the alcoholic’s troubles is not religious, but human. According to the playwrights, Bill and Bob didn’t better in the Oxford Group, not really; they got better because of a relationship—their relationship to each other. Authors Bergman and Surrey are therapists by trade and view the story of AA as a story about the power of relationships to heal. Their view is not unique, and many AA members would agree. However, it seems that the authors emphasize relationships to the exclusion of spirituality. Or at least to the exclusion of God as Bill and Bob might have understood God. The closest this Bob ever gets to talking about God is to refer in his closing lines to an “invisible thread that connects us all”—mind you, this is not a bad conception, just probably not the one that Bob (the real Bob) would have chosen for the only reference to his faith. And so, with this one precaution, the DVD of Bill W. and Dr. Bob comes recommended. A moving encounter with AA history, if perhaps a bit skewed by the biases of its authors. I enjoyed your review. I am portraying Dr. Bob in The La Quinta PlayHouse (Palm Springs CA area)version of Bill W. & Dr. Bob. I feel the same as you that the spirituality of the men is not only played down but in some cases venomous towards religion. This I am sure to the author’s personal feelings rather than reality. Still, I do not feel comfortable with the inaccuracies. If one goes to that much trouble to write an account of the beginnings of A.A. Why not give an accurate portrayal? Anyway I am looking forward to opening night and hopefully my portrayal will touch the audience in attendance. Thanks, Ron, I am portraying Dr. Bob as well in Bill McNiff’s play “Genesis” which is another portrayal of that famous evening; I guess only those two gentlemen will ever know what was REALLY said, but it was good. McNiff evidently knew Bill Wilson and has done much research and writing on the AA history so I am hopeful, as you, the audience finds something that touches them. It should be “up” and for sale by March of 2014 on our website and Bill’s. You can already view “Moments…an Evening With Bill W.” on Youtube which was first presented in Scottsdale in April 2013.